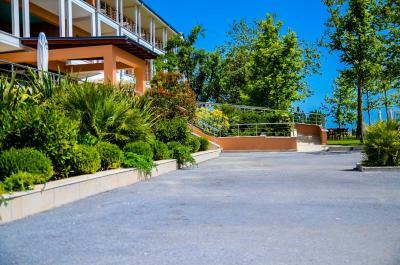 Lock in a great price for Hotel Giannoulis – rated 9.1 by recent guests! Comfortable, good facilities, clean, tasty breakfast, great location, great customer service. 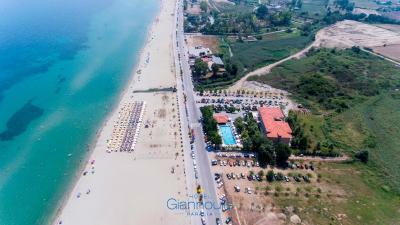 Located 2 km away from down town Paralia, Hotel Giannoulis offers a nice stay for families with small kids. Good size room, very clean and very quiet (mountain view room), good breakfast, very helpful staff members, big private parking lot, nice swimming pool and bar. The room has a good size balcony featuring a table and 4 chairs. My kind advice to the owners is to invest in some clothes drying racks for the towels and swimming suits. The guests will not use anymore the table and the chairs as a drying rack and their lifetime will be prolonged. Transport to and from Paralia and/or Olimpic Beach is possible by bus or by little vacation train if one don't want to use a taxi. The bus station is located just across the street. The buses are stopping by default but you have to wave your hand for the little train to stop. Nice and cozy rooms. Excellent location. Friendly stuff. A new and cozy hotel. Excellent cleaning of rooms. Helpful staff. Friendly and helpful waiters at the bar and on the beach. Wonderful view from the window. The location of the hotel is great - close to the beach, not so close to the town(s). The staff is really friendly and kind, the service and the breakfast are good. Comfort, clean and spacious room. The towels were changed and the room was being cleaned every day. Very convenient parking lot. 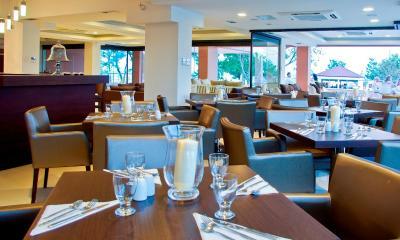 Hotel room, breakfast terrace, sea view and the Olymp Mountain, the promenade, beach and swimming. .. Very nice property at really good and relaxing location. Almost it the middle between Paralia and Olympiaki akti you will have to walk (or ride) about 1-2 km to get to the nice restaurants. But this same distance will dramatically minimize the crowd on the beach (at least in the beginning of September). There are many locals who prefer this part of the beach. So, don't be surprised by a bunch of Greek grandmas around your sunbed. They always have something long to say :) :) The room is spacious and clean. Sea view comes with pool and bar "view" so plan wisely if you are intending to stay longer inside and don't like the noise. Only one key card per room is allowed. That might be not completely comfortable but it's an acceptable "price" for the disciplined housekeeping which relies on it. Staff is always helpful and smiling. Very close to the beach. The garden around the pool was great - with big trees and fresh green grass. The kids (1 y-o and 4 y-o) enjoyed it as much as the beach. The hotel was very clean. Not only the rooms, but also the common spaces. They changed the towels and bed linen daily which was great because after a day on the beach everything becomes moist and sandy. Everybody was nice and smiling. Really a pleasure to stay there. Hotel Giannoulis This rating is a reflection of how the property compares to the industry standard when it comes to price, facilities and services available. It's based on a self-evaluation by the property. Use this rating to help choose your stay! 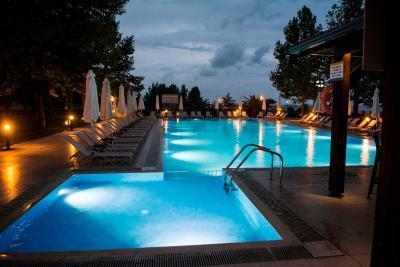 Enjoying a beachfront location in Pieria area, Hotel Giannoulis features an outdoor pool with separate children’s section amid lush greenery. It offers elegant accommodations and a beach volleyball court. Drinks and ice-creams are served at the poolside bar. 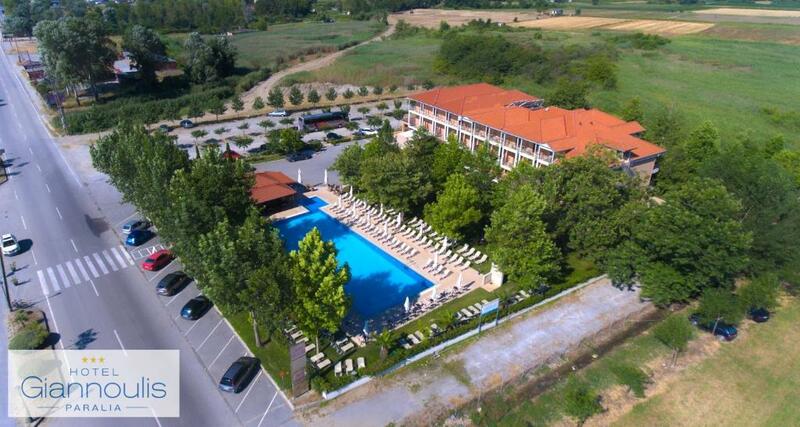 The hotel lies 1,650 feet from Olympic Beach and 0.9 mi from the lively Paralia Katerinis. The archaeological site of Dion is 9.3 mi away and the main town of Katerini at a distance of 3.7 mi. Free on-site parking is available. 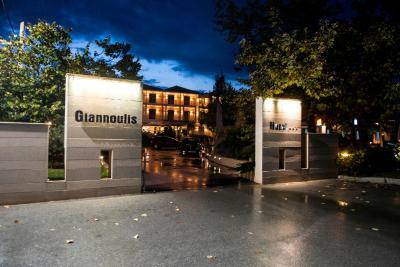 When would you like to stay at Hotel Giannoulis? Enjoying views of the Thermaic Gulf from its balcony, this elegantly furnished room is a few yards away from the beach. It features free Wi-Fi, air conditioning and a flat-screen TV. Free toiletries and a hairdryer stock the bathroom. Just a few yards away from the beach, this elegantly furnished room offers views of Mount Olympus from its balcony. It features free Wi-Fi, air conditioning and a flat-screen TV. Free toiletries and a hairdryer stock the bathroom. Just a few yards away from the beach, this elegantly furnished room opens to a balcony facing Mount Olympus or the Thermaic Gulf. It features free Wi-Fi, air conditioning and a flat-screen TV. Free toiletries and a hairdryer stock the bathroom. House Rules Hotel Giannoulis takes special requests – add in the next step! One child from 5 to 12 years is charged EUR 12 per person per night in an extra bed. Hotel Giannoulis accepts these cards and reserves the right to temporarily hold an amount prior to arrival. There was no stand for the hand shower. breakfast could be improved, otherwise pretty poor, coffee too. The room is not good enough. It’s too expensive for the quality they offer. Very poor breakfast. I've imagined the swimming pool bigger, and not so cool, which wasn't the case. The view from the room was not super, Olympus yes of course, but the land near the hotel not so clean and nice. It's clean and fresh. The staff is kind, just walking distance from the beach. There were spider webs on the balcony and mosquitos in the evenings, and some ants in the room. There were no stand for the hand shower, so you have to take a shower with a hand acting as a shower. Sorry, but I can't get why?! The two ladies at the reception desk and the two chambermaids were very kind and polite. Comfort, clean and spacious room. The towels were changed and the room was being cleaned every day. The breakfast was good. Very convenient parking lot. The hotel is really close to the beach. The pool was nice but it could be crowded during the weekend or in the high season as it is not only for the hotel guests. Great hotel, located on the beach. Modern and new. We had room on the second floor, with sea view. 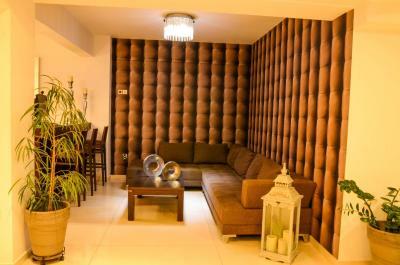 Very nicely furnished, with comfortable beds and spacious bathroom. Parking in front of the hotel. Friendly staff! Very spacious room. Clean with extra pillows. There is a good beach right in front with good amenities. The pool is very nice and there is also a nice bar. The staff was most polite and helpful.